DigiLocker is a key initiative under Digital India, the Government of India’s flagship program aimed at transforming India into a digitally empowered society and knowledge economy. Targeted at the idea of paperless governance, DigiLocker is a platform for issuance and verification of documents and certificates digitally, thus eliminating the use of physical documents. DigiLocker provides a free, secure, personal account with dedicated storage space to citizens of India. DigiLocker website can be accessed at https://digitallocker.gov.in/. 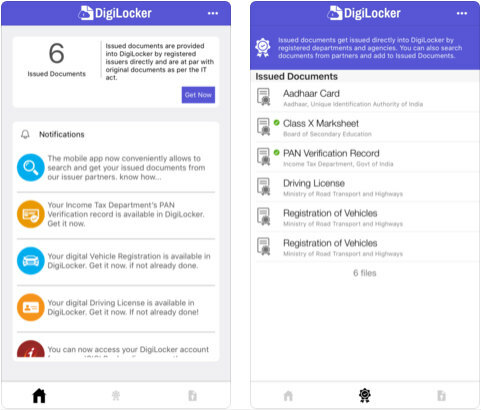 You can now access your documents and certificates from your DigiLocker on your iOS devices.